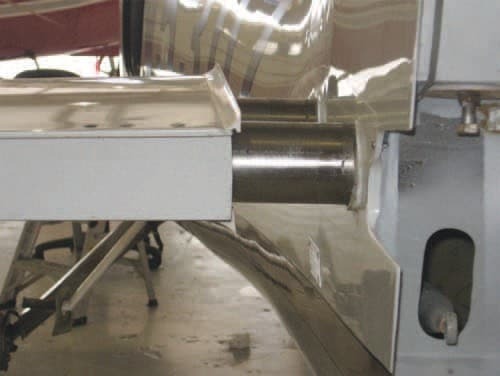 Calibrated Hammer (or AD2013-11-10) | Tennessee Aircraft Services, Inc.
I’ve spent the vast majority of my aviation career working on aluminum airplanes. Only in the past decade have I ventured into the composite world. There are few commonalities and many things to learn. Generally speaking, composite repair and inspection call for a very different set of tools and skills. Many of the skills needed aren’t all that new, just newly applied. In aluminum structures, one can easily look at the metal and fasteners and tell if the structure is sound. Corrosion: we all know what it looks like, what causes it, what it’s going to do, how to stop it, and how to prevent it. Shaping aluminum in the shop for field repairs is a very old (in aviation terms) art for which much has been written and passed down. The tribal knowledge base for aluminum aerospace structures is pretty solid. Composites are a totally different animal. With composites there are layers of glass cloth and unknown (to most mechanics) chemical compounds that mysteriously hold everything together. Current day composites are very new (in aviation terms), so the maintenance tribal knowledge base is fairly thin. 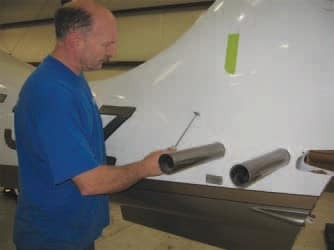 I’d say traditional metal airplane inspection methods don’t apply to composites but it’s possibly more accurate to say traditional application of metal airplane methods don’t always apply. Visual inspection is the most common and always the first method of choice or necessity. Even if we’re using high tech Eddy Current electronic system for defect detection, we can’t help but look at the subject area first. Many defects in composites are hidden from view by a pretty coating of paint or layers of glass cloth. Finding those problems hiding from easy view calls for some economical way to “see” inside without calling in the high dollar electronic inspection devices. Vibration is an amazing tool that’s been used in many fields to find “invisible” defects. Doctors may tap on a patient’s abdomen, chest and and back to listen for returning sounds. A skilled and experienced technician might detect all sorts of problems from fluid in the lungs to a mass in one’s stomach. We used to have an antique (old) dining table with a beautiful cross cut oak veneer top. Every time I sat at it I couldn’t resist tapping around the top to find that one spot where the veneer had separated from the solid wood base underneath. I could tap around with just my fingernails to define the exact perimeter of the disbonding. Airplane mechanics have been tapping on engine exhaust pipes for years. A nice ringing sound indicates a good solid stainless steel pipe. A dull thud sound is where the metal has deteriorated and is no longer strong enough to safely remain in service. It doesn’t take much experience to find the most common exhaust failure is on the outside diameter of a pipe bend. Gentle application required to prevent damage to the painted surface. Composite structure has several layers of glass cloth that must stay bonded together. Almost any structural damage defect will be associated with separation between some of these layers very similar to the veneer on the dinner table. With all its high tech qualities, I find it comforting that a composite will yield so much hidden information with such an old school common sense inspection method. It’s like having a low tech X-Ray machine. There have been several highly publicized extreme braking events on the Columbia/Corvalis series airframe which caused dangerous structural damage to the empennage section. The Columbia/Corvalis has a unique main landing gear geometry where the steel tube legs sweep forward. On the subject airplanes, the legs slide into a mount in the fuselage with bushings that are bonded in place. The damaging event begins when the brakes are locked for a prolonged period of time or heavy braking occurs when one or both of the gear leg bushings slips out of position. An out of place bushing allows the gear leg to move a great deal more than normal. In normal braking, the mass of the airframe wants to continue forward as the tires are working against that to decelerate the aircraft. In extreme braking situations these opposing forces flex the gear legs aft which actually lift the aircraft. If the leg bushings have dropped out of position the amount of movement is dramatically increased. At some point, one of the tires will lose traction sliding forward returning close to its normal position. This swings the tail of the plane in that direction as it drops. About this time the opposite tire releases as the first tire gains traction again. A violent oscillation is begun which continues until the plane comes to a stop. The lateral swings can become so violent that it whips the mass of the tail feathers. There is enough force in these events to fracture the tail cone forward of the tail feathers. The damage is severe enough to render the plane unsafe to fly. The FAA has issued AD2013-11-10 to address the braking problem and the inspections they feel are needed for these planes.The AD applies to all the Columbia 300, the 350 through serial number 421020 and the 400 through serial number 411161. In a nutshell, new braking procedures must be added to the airplane’s POH, initial inspection of the airplane’s structure performed, and new inspections are called for if one of these extreme braking events occurs. Another small but very significant part of this AD is the requirement to incorporate revisions to the airplane’s maintenance program. The easiest way to do this is to use the most current revision of the Cessna maintenance manual. As the owner, you may not have access to the manual your mechanic uses and wouldn’t usually ask about its revision level. Since FAR 91.403 paragraph (a) specifically puts the owner/operator in charge of, and responsible for, ensuring compliance with FAR Part 39 Airworthiness Directives, you might make the effort to check that the proper revision is being used for your maintenance. Sliding the left horizontal stabilizer off for access to the structure for inspection. Paragraph (g)(5) details the parts of the maintenance manual that must be used to comply with the inspection part of the AD. The three different areas of the manual described the complete process from removing the horizontal tail feathers to detailing the inspection procedures to defining the hammer needed for the percussion tests. The 400 maintenance manual chapter 20-90-00 not only describes the percussion test methods but also calls out the needed precision test instrument; a hammer. This is not Thor’s hammer. This hammer should have a one ounce head and a lightweight handle good for an easy touch with one’s fingers, not a fist. The business end of the hammer should have a large radius with a smooth finish. This will help limit any damage to the painted surface to be tested. If the tapping of the hammer isn’t quite square, there won’t be an edge to make contact. To use this tool will require a fairly quiet shop where the returning sounds can be easily heard and distinguished. The sound will differ a bit with the thickness of the structure. It will tighten up a bit where there are bulkheads, close out panels or support structure mounted on the inside of the plane. For large inspection areas, it’s a good idea to create a grid pattern with masking tape or some other method to keep up with where you’ve been. There’s no problem if a spot gets checked several times but could be very bad if an area is missed. Super Hi-Tech hammer fabricated in house for precision percussion inspections. Owners of these planes that follow the industry and keep up with model specific forums are well aware of the braking requirements of this plane. It doesn’t take much effort to mitigate braking problems: check the position of the gear leg bushings at every pre-flight and avoid situations that require maximum braking efforts. The FAA’s urgency is that some planes may have experienced a severe braking event that the owner might not have recognized. The model is also now old enough that some planes are on their second or third owner, and all the plane’s history may not be known. Whatever the reasoning, the FAA has a pretty low tolerance for structural failures. The requirement is just for the one time baseline inspection which takes about 4 ½ hours to complete and repeat inspection only after a braking event as described in the AD. The possible damage from one of these events could cause loss of control of the aircraft so spending a half day tapping around the tail of the plane seems a pretty small price to pay for some peace of mind.